India's top court has found a senior judge guilty of contempt and sentenced him to six months in prison. 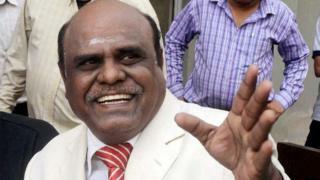 Justice Chinnaswamy Swaminathan Karnan of the Calcutta High Court was found guilty of writing letters and making allegations against fellow judges. This is the first time in India's judicial history that a high court judge has been jailed for contempt. For the past few months, Justice Karnan has been on a collision course with the judges of the Supreme Court. He was stripped of his judicial powers in February. The stand-off dates from January, when Justice Karnan wrote a letter to Prime Minister Narendra Modi flagging up the names of 20 "corrupt judges" and three senior law officials. Even though he failed to provide any evidence against those named in the list, he urged Mr Modi to investigate and take action against them. After that he was summoned before the top court and barred from performing any judicial or administrative functions. Justice Karnan responded by accusing the seven judges of caste discrimination, banning them from leaving the country and demanding compensation. A seven-judge Supreme Court bench that included Chief Justice JS Khehar then ordered a psychiatric evaluation of Justice Karnan by a panel of government doctors. Justice Karnan angrily responded by ordering similar tests for the seven top court judges.